So I am a first time owner of a parrot, and I was kind of happy because I thought I picked a good one from the store. Day one went fine he hung out with me almost all day we played and talked and had a grand old time. Day two not so well. I had him out and was playing with him and he was eating a fruit salad just fine, and my wife's cat got into the bedroom. In a panic I took him and threw him in his cage. Now we are not on speaking terms. He will take grapes from my hand, and if I sit and talk to him he kind of talks back, but if I try to get him to step up, he nips at me and puffs up, and he makes this weird growling chirp I never heard before. So I am at a loss. You need to start from the beginning again. Parrots can keep grudges. You do not say white kind you have. I scared Myrtle once. For 10 days she would not talk to me or come to me. Don't worry about him not stepping up. Open his cage so he can come out when he is ready. You took his freedom and he has to feel that he got it back. He stepped down a bit this morning but when he came out he got mad and tried to peck hard at me. He wanted to go right back to his cage. Now he is just yelling and puffing at me. Welcome to the forum! Before we can try to help you, please give us some information about the bird. What species? How old? What is he being fed? Does he come out to fly? If so, for how long? Where is his cage (both room and height]? Does it have a 'moat' door or a perch outside the cage? You should not be trying to get your bird to step up the first few days. He is in a completely different cage in a completely different room with completely different people. This is a very stressful time for your bird and you should not do anything that could stress your bird out. After the bird has gotten used to its surroundings, you can start to put your hand near the bird to see if it will step up. Do not force it if the bird doesn't want to come out, just keep your hand near it and talk to it so it can get used to you. What kind of parrot do you have? Was it handfed or parent-fed? How old is it? 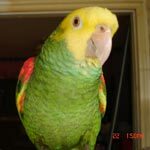 Tell us about your cage, diet, toys, perches, and if the bird is flighted or clipped. jardine's. I think he is 3 or 4 months old. There are multiple things going on in his mind. You took him from what he knows and into a place he is afraid of. You are also a predator in his eyes and not to be trusted. He is afraid of hands that could grab him. He is fearful because he knows he can't fly from a fear. They are afraid of hands but like to talk to faces. I have some Cockatiels who are still afraid but use the cage to protect themselves. They know the cage will keep me out as well as keep them in. The cage doors are open but some birds will not communicate with me if they are out of cage. They are not afraid of faces. Put your bird so that one of his perches puts him at your eye level and he will not fear being grabbed. With the door open he knows you are respecting him and a high perch gives him confidence. When he is fully flighted his personality will change. He will fly to you when he feels you can be trusted. There is a little "being" inside those feathers. OK. First thing you need to do is put his favorite perch at your eye level so he doesn't feel you are looming over him. Second thing you need to do is not stare at him for long (just look out of the corner of your eyes]. He needs to get soft foods twice a day, served warm and fresh. This is not only because he is still too young for adult food (think a toddler!] but also because this easy to eat, soft, warm food will remind him of what a parent gives them and give him comfort as well as create a bond between you two. Parrots should never be free-fed protein food (pellets, seeds, nuts, nutriberries, avicakes, etc] but babies can eat some during the day as long as it's not too high in protein (a budgie mix will do but don't just fill up a bowl and leave it there or he will never learn to eat a healthy diet and you will never be able to train him]. Sit next to him for as many hours as you can leaving the door to his cage open so he can come out if he wishes. If the cage doesn't have the 'moat' door (this is the kind that locks on to top of the door and opens down locking into a horizontal position], put a perch right outside his door near enough so all he has to do is simply step from the opening onto it. Be careful not to scare him (move slowly, don't stare at him and talk in a low, singsong reassuring him] because if his wings are clipped and he gets startled, he will fall like a rock to the floor and might hurt himself. Once he gets used to his diet, he will be willing to take a seed from your hand but you can also try with a piece of a good quality, whole grain bread (they love bread!]. Handfed birds are imprinted to people so the only reason why he is scared of you is that he doesn't know you and doesn't know if he can trust you so, if you take your time and reassure him by not forcing yourself on him, he will relax and crave your company and love. This first few months are the foundation where your entire relationship with him will be built and it needs to be one of complete trust (love doesn't grow without it] so take your time, spend, at least, four hours a day with him with the cage door open, talking, singing, whistling to him, offer comfort food and be patient and loving and he will reward you with his unconditional love.